The results are in! Although I was envisioning being able to announce that every last tester was completely swept off their feet with the wonders of petrolatum-free lip care, it wasn't quite that cut and dry. Despite this, I am not the least bit unhappy with the results this test has produced. If you remember, I wanted to find self-proclaimed constantly-struggling-with-dry-lips testers who were also hard-core petrolatum product users. I basically asked for the worst thinkable odds – and even enlisted help to achieve this. 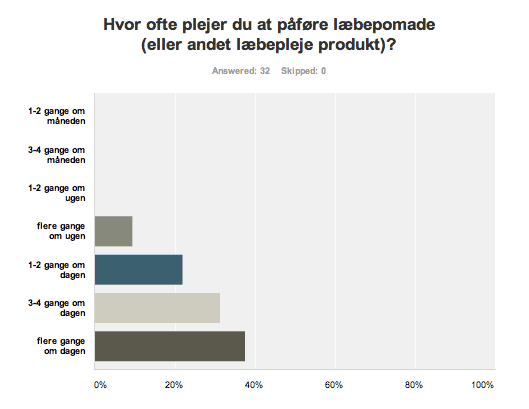 Anette at BeautySpace was kind enough to recruit, scan, and provide the (Danish) test group. 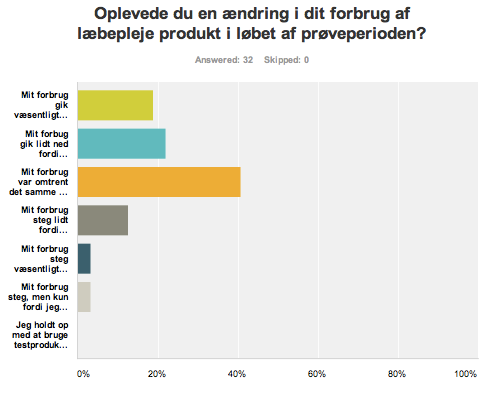 At the end of February, test products were made and sent to the 33 participants: 32 in Denmark and 1 Dane who is mainly in Spain (tee hee.. had to throw that little rhyme in). Approx. 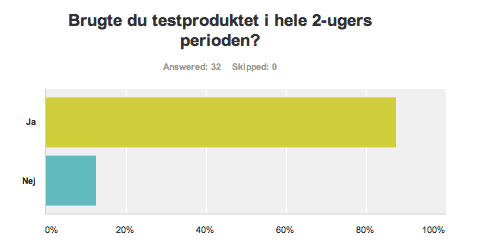 2 weeks after the products were sent, testers received an email with a link to an online survey. 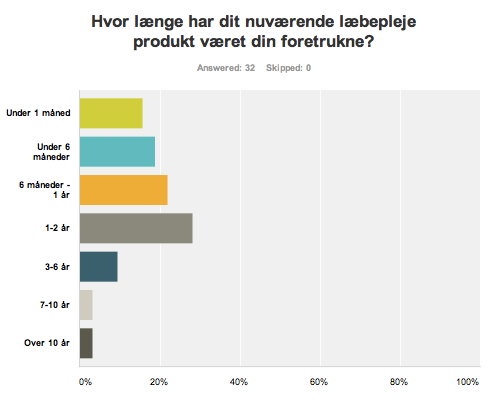 32 testers answered the survey questions. I used a free service called Survey Monkey to set everything up. All answers were anonymous. 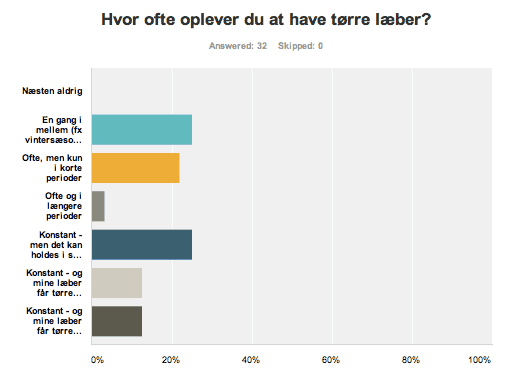 Survey Monkey also provided the graphs below. Almost every question included a field for 'additional comments'. 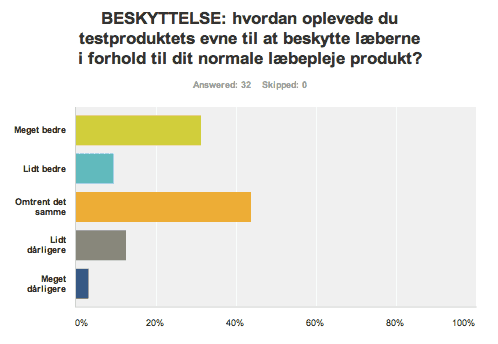 Many of the testers provided additional input - the large majority of which was positive. I have included only excerpts of the positive comments, as many were similar. There were very few negative comments. I have, however, included almost all of the negative comments, as these were more varied. reported that the test product did a 'better' or 'far better' job of protecting their lips and they subsequently 'didn't need to apply as often'. How often do you have dry lips? "I often get red lips (in a line so it looks like I'm wearing lipliner) and it stings and I can't keep myself from moistening my lips by licking them, and that makes the problem even worse." "I'm nursing at the moment and am out walking with the baby carriage several times a day. Both my lips and hands suffer from that." "If I don't use something every day, my lips would be dry." How often do you apply a lip care product? How long has your present lip care product been your preferred product? 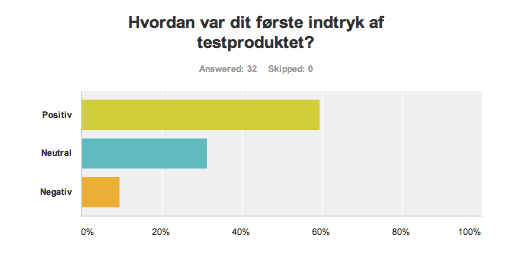 How was your first impression of the test product? 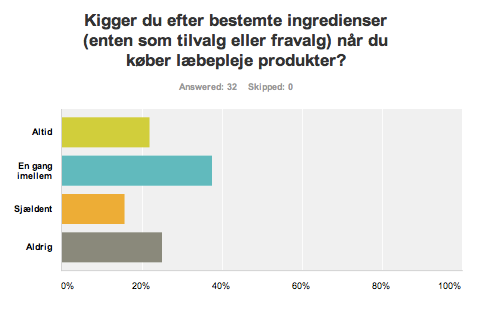 "Didn't like that I had to apply with my fingers"
"Didn't like the smell - it reminded me of sheep"
"I loved the consistency and the neutral scent"
"Really positive - felt great with no taste and no scent"
Did you use the test product for the entire 2 week period? "I was traveling so it was only a week and 2 days"
"I ran out of product after about 8 days"
"Yes and I am glad I still have some left because I've been using it on my cuticles and nails. My nails are look better and have stopped splitting and cracking - not to mention what it's done for my lips." "I didn't use during the day as it dissolves my foundation." MOISTURE: How was the test products ability to moisten and soften your lips as compared to your regular lip care product ? "It softened in a different way than my normal product." "It disappeared during the night. I was up 3-4 times a night and it wasn't there any more and my lips felt dry." "My lips have become much softer and I noticed I didn't need to apply as often." "I experienced the product absorbing quickly. It also had a very immediate soothing effect, but I would have liked to have a longer lasting feeling. Maybe if there was some shea butter in there.."
"My lips and nails feel so much better. The moisturizing has been so effective that I didn't need to apply as often." "I experienced my lips stayed soft longer than normal." "It wasn't so fast at removing the flaky lip feeling." "I didn't feel any difference in this product to my regular product. It did exactly what I expect of a lip balm." "I am super satisfied with how effective this product is. It's really nice to have a feeling of soft lips all the time. My only complaint is the taste. It tasted like kissing a sheep! "I felt like it absorbed too quickly. It felt good and moisturized well upon application, but after half an hour it had absorbed leaving my lips drier than when I started." PROTECTION: How was the test products ability to protect your lips as compared to your regular lip care product? "I used it several times a day - depending on how the weather was. It works like my regular product but I became quite fond of the the test product"
"I'm not quite sure what is meant by protection"
"The product absorbs quick - especially when I go outside in the cold, so I don't think it gave very good protection - especially in strong cold winds"
"I didn't feel any difference in this from my regular product in the winter cold." "Both softening and protection were vary satisfactory - especially because we've had some real cold days"
"It felt like wearing a 'film' on the lips if it was applied just before going outside into the cold"
"The test product kept my lips softer and more moisturized longer than I am used to"
"My lips cracked and flaked even though I used the test product. They don't do that with my normal product, which I have used for over 7 years"
Did you experience a change in your pattern of use during the test period? "I forgot to apply because it wasn't necessary - even with the freezing weather we've had"
"I had to dig out my regular product a few times because my lips got too dry and the test product couldn't fix it"
"I haven't used as much as I normally do"
Do you look for specific ingredients (either as must-have or must-avoid) when you buy lip care products? "Avoid perfume and essential oils"
"I avoid scent and taste"
"I avoid ingredients that can be bad for the environment"
"I try to avoid perfume and parabens"
"After testing this product I will be looking for petrolatum-free"
A very special thanks to Anette at Beauty Space for finding the 33 self-proclaimed dry-lipped, petrolatum-product-using people who participated in this study. Thank you testers, for your willingness to put your beloved regular lip care product away for 2 weeks, and for providing your honest feedback. 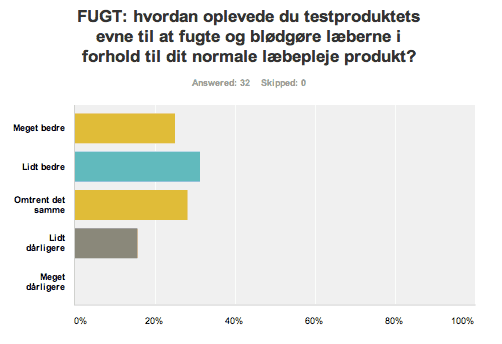 What Was The Test product?? 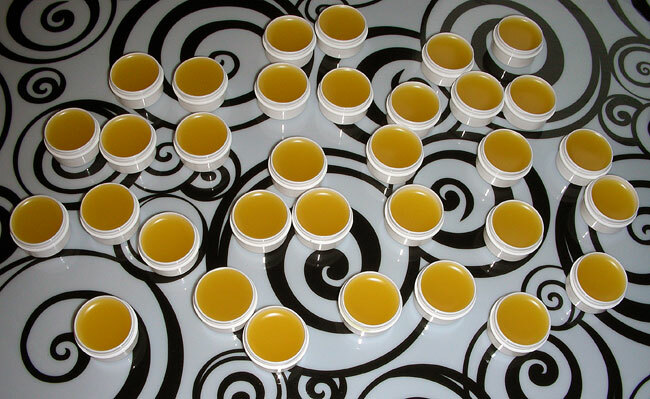 The Ultimate Balm Gloss Pot (without any essential oils) was the test product. Pictured above, the production of 5ml sample pots that were made especially for this test. "Until proven otherwise, mineral oil is the best choice for skin care"
Would You Like Some Vine?